The 3-day music electronic music festival is back in Chattahoochee Hills, a 30-minute drive from Atlanta, for its third year. Lodged on +/- 500 acres within the 8,000-acre of the Bouckaert Farm, an equestrian paradise owned by one of our Belgian citizens, the artists will perform among multiple uniquely designed stages. 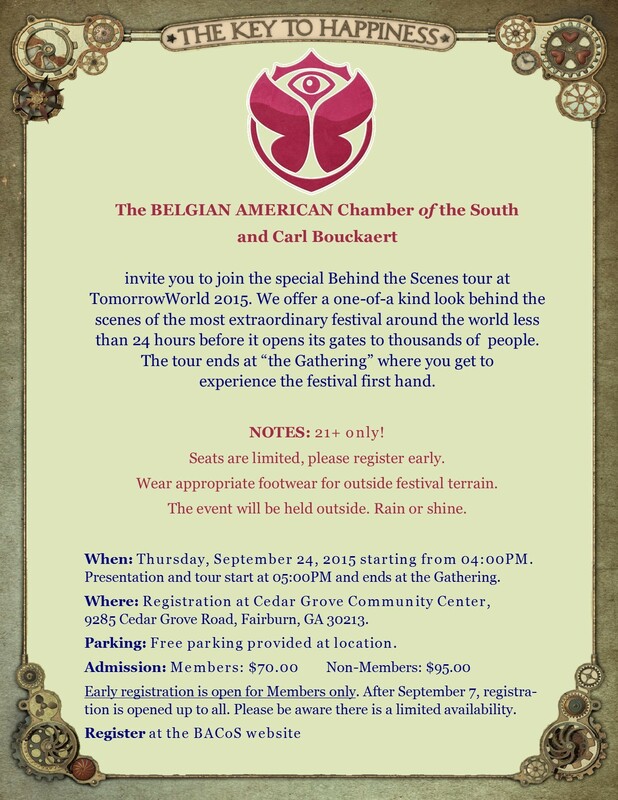 Be ready for innovative and immersive experiences with mind-blowing décor, enchanting acts and animation, A-class camping, eccentric VIP areas and gourmet food..
Before the festival starts, the Belgian American Chamber of the South (BACoS) invites you Behind the Scenes at TomorrowWorld on September 24th, 2015 from 4 pm. During this exclusive members-only event, guests get the opportunity to take a sneak peek behind the scenes of the world-renowned electronic music festival: tour of the beautifully themed TomorrowWorld stages and the mind-blowing decor. And to top that off, they will experience “The Gathering”, the warming up party for the TomorrowWorld campers! This event is restricted to 21+ and costs $70 for members | $93 for non members. Advance registration recommended. For more details and registrations about this BACoS event, visit their website. Dimitri Vegas & Like Mike (Willebroek) are a Greek-Belgian electronic DJ duo composed of two brothers Dimitri Thivaios and Michael Thivaios. Yves V (Antwerp) is the artist name of the Belgian DJ Yves Van Geertsom. He is mainly known for his record “CloudBreaker” which he made in collaboration with the Belgian producer Basto. Romeo Blanco (Antwerp) – Christened as future talent by CR2 Records, Romeo Blanco has continued to prove himself a worthy new member of Electronic Music Aristocracy. Listen to his performance with Yves V.
DJ Licious (Antwerp) – Belgium-based but beaming the love of house all over the world with a blend of funky rhythms, groovy sax and smooth vocals: Dj Licious knows good vibes come from nothing but house music. Restrictions: strict 21+ age requirement. Anyone born on or after September 25, 1994 will not be permitted entrance, even if accompanied by an adult.